Above is a flow chart that I sketched out during a long car journey to the Balkan Investigative Reporters Network Summer School in Croatia (don’t worry: I wasn’t driving). It aims to help those doing data journalism identify how best to get hold of and deal with data by asking a series of questions about the information you want to compile and making suggestions on ways both to get hold of it and tools to then get it into a state which makes it easier to ask questions. It also illustrates at a glance how the process of ‘getting hold of the data’ can vary widely, and how different projects can often involve completely different tools and skillsets from previous ones. I will have missed obvious things, so please help me improve this. And if you find it useful, let me know. Click on the image for other sizes. 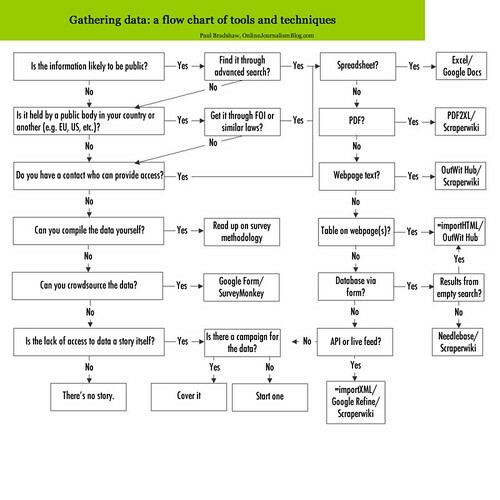 This entry was posted in data journalism and tagged flow chart on September 6, 2011 by Paul Bradshaw. Thanks Paul – that looks like a really useful aide-memoire, especially when I’ve run into dead-ends with my own methods. On the “Results from empty search? > No > Needlebase/Scraperwiki” section, you may want to delete Needlebase since it is about to be retired. But, since the folks at Outwit Hub have added a POST function, and you can generate query matrices in Outwit Hub, perhaps it should be included in this section? Thanks – will update the image.